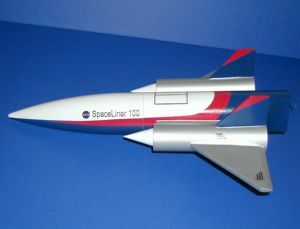 The following are tips that EMRR has successfully used in building and finishing rockets reviewed on this site. Let us know if you have any questions. First sand the entire plastic nose cone with 150 or 220 grit sand paper until all shine is removed (yes this will be scratching the surface). Focus some effort around the seam. Then apply a very heavy coat of Gray Plasti-Kote Primer to fill in all the scratches from sanding. 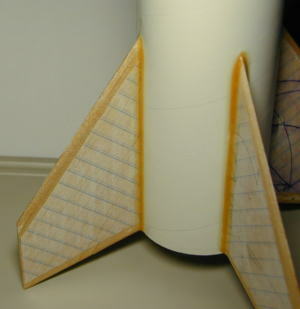 Use several thick coats directly on the nose cone seam and then sand it back until the seam is filled. Once the seam is filled switch over to a 340-400 grit paper between coats. This can usually be done with a couple of thick coats and a couple of thin ones. I have never had nose cone paint chipping issues using this technique. The procedure and pictures are courtesy of Missile Works. Use a coupler tube (I used 8") for the electronics bay and cut 2 birch dowels (about 3/8" dia) so they are .25" shorter than the overall coupler length. Drill and mount a #6 threaded insert into one end of each dowel. Epoxy the dowels inside the coupler section .125" from the end (180 deg apart). Permanently epoxy one of the bulkheads to one end of the coupler, flush against the ends of the dowels (the ends without the brass inserts). Place your coupler section (glued bulkhead end) into the upper body tube (main parachute) compartment to the coupler midpoint. Drill your static port hole and fastener holes. Running the calc's for volume and port sizing, a 0.1" hole size (single) should be used. Use a recommended 3/64" port (smaller is better). Remove the coupler. Epoxy (2) 2-56 blind nuts into the coupler section into each 1/16" hole. 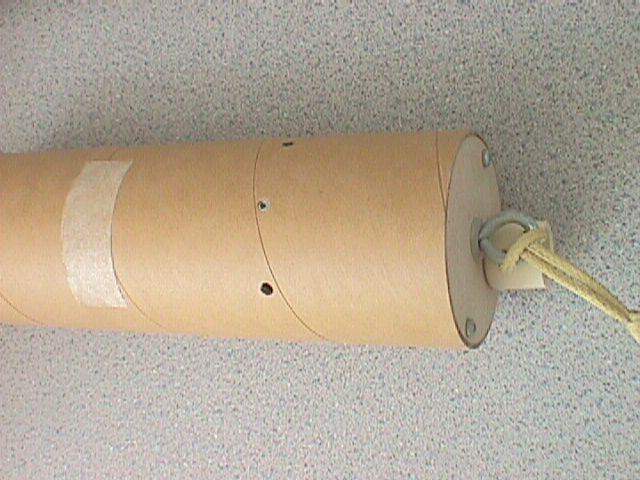 This will hold the coupler captive to the upper body tube and will allow you to remove it to prep the electronics and deployment charges. Elmer's ProBond Weather Resistant Wood Glue for exterior use. It says: Weather Resistant, No-Run Gel Formula, Contains Wood Fibers for Superior Staining, Strong Wet Tack. I love how it sticks and stays where I put it. It does give a quick tack. Put a thin coat on the root edge of the fin and place it on the body tube. Press and hold for just a couple of seconds and let it dry. It doesn't slide or tilt like when using white glue. It also is good for filling flaws, dents, breaks and sands nicely. It does shrink though. I have used it for fillets and it shrinks and therefore several coats are needed. However, I have been using this for the initial fillet and then using epoxy over the top to get the smooth performance of epoxy on the fillet. Elmer's ProBond Polyurethane Glue. 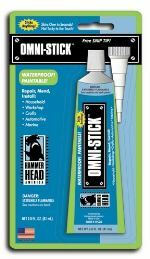 It is called "The Ultimate Adhesive", "Bonds Virtually Everything", "Super Strong", "Sand Easily", "Water Proof", and "Stainable/Paintable". 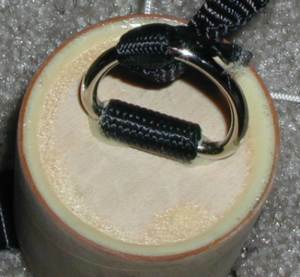 The outside cover said that it is the strength of epoxy without the mixing. In general, I found the glue easy to work with exception for one primary issue. It expands somewhat in volume after being applied. 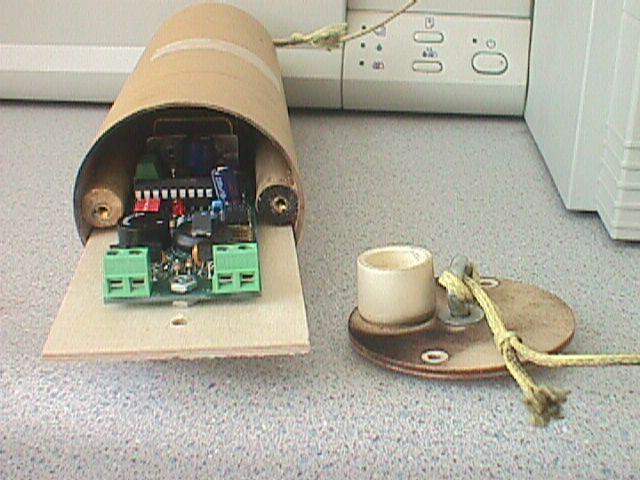 This has not been a problem for attaching centering rings to the motor tube and to the inside of the body. 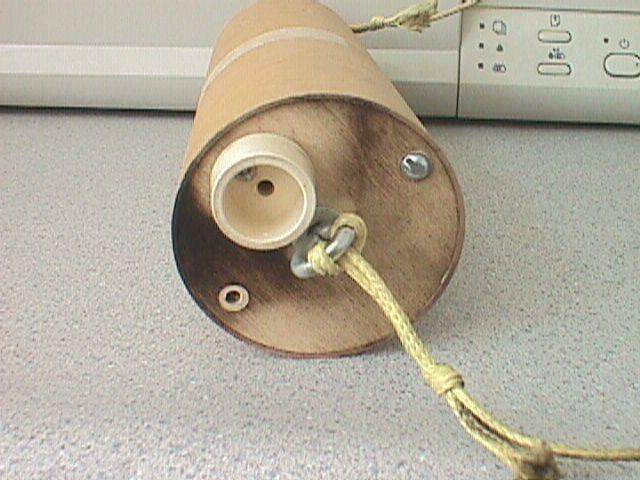 It has been fine for attaching nylon straps to the motor tube and to pistons (if used). Once dry it appears porous, but it does sand easier than epoxy and I had no primer interactions. Some comments on Quick Grab glue: It promises to be crystal clear, water-proof and paintable. It was. It also claimed to be fast drying, 40 second grab with light load support after 10 minutes and full load after 24 hours. It did this, too. In fact, the only problem with the glue is that it gets a skin quick and therefore has "stringers" of glue that you have to control. It did great on attaching fins and can be used to "spot" hold fins on larger models before using epoxy. Although I have successfully made fin fillets, it is much harder to work with due to the "skin" and I wouldn't recommend it over epoxy. Also, I have successfully used it on gluing motor blocks or centering rings, but due to its thickness I wouldn't recommend it over wood glue. I would recommend it for smaller models (A - D motors) since it gives you fast drying time and is much cheaper than CA. The pro's are the cost and durability, which seems every bit as good as other brands I've used. The con's are color selection, however for $1.39/can you can improve your color selection and still not pay the standard $2.49+ for other popular brands. Also, according to instructions, additional coats must be done within 4 hours or after 1 week. So in the case of two different colors, you'll have to wait a week before doing the second color. But, after the second color and within 4 hours, hit the whole rocket with their clear coat. If you're not in a hurry, I think, the pro's outweigh the con's with this paint.